As educators, we spend much time reading and studying. We know reading is the foundation skill for learning. Perhaps in your classroom you have compiled many books to share with young learners that demonstrate the importance of reading. Sometimes we use bookends to support the series of books and make the book titles stand out. 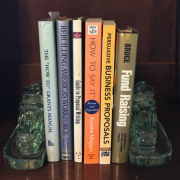 My sister knows my love for horses and gave to me a pair of glass horse bookends that I proudly use to support the many resource books I have on grants, RFPs and other funding sources. By positioning them on the opposite ends, this pair of supports enables my books to be easily accessible to me. Lately in my survey of grants, I am seeing the bookends of education quickly becoming a growing funding movement. The bookends of education are Early Learning and Workforce Development. As the 2019-2020 school year approaches, consider how your school offers solutions to support the bookends of education. Perhaps you offer solutions to benefit the Whole Learner. Look to funding to support the continuum of learning. It is available, here and now!